Hey this is my amateur project I'm building with Unity. Has been in development for about 5 months in Unity and is nowhere near completion but you can keep reading to download the free demo below. This game is meant to be a "take care of your own anime character" simulator. An interactive fan game featuring Oshino Shinobu from the anime series Bakemonogatari. Features a responsive AI, advanced animation and logic blending, and my current work with anatomy and modelling. This blog will be geared more towards the technical aspects of development. If you like following game development and/or are a developer yourself, we might be getting along well. A free as in beer PC VR standalone game complete with fully fledged activities and fun past times. A tamagochi on steroids. This video will serve how to complete all the features in the checklist. I had a lot of fun working on this release. Squashed and cleaned up many bugs. Everything should work robustly as I tested it extensively. 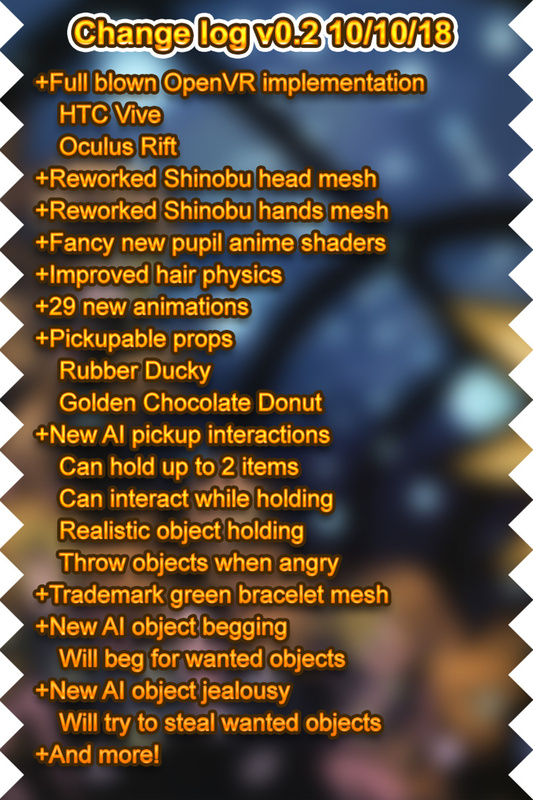 The changelog covers the big new features. The game should work with Oculus Rift controllers but since I don't have an Oculus Rift, I was not able to test it on that platform, if you run into a potentially disastrous bug, send me an email! *If you fall off the map, you must restart the game! *Currently she can only throw objects with her right hand. She will not throw donuts! An advanced Unity approach to solving character believability. Early build of the main character logic modules. This project is still under development and everything is made from scratch (no asset store). #SEKIRO is the easiest Souls game. Shame on the people who play without Sinister Burden! Cough reviewers cough.